Our current time period tasks artists with the challenge of pushing the limits of art and asking ourselves, almost to the point of insanity, what is art? Is it a pile of rocks made in a river? Is it graffiti? Can a performance piece done in a gallery only once have the same artistic merit of a painting? These are the questions that drive our current creative world. Who can paint a cello player better? Who can make the best feathers on a parrot? Who can paint an average person writing a letter? All of these questions were what made the Dutch painting world of 1600 - 1700 run onwards towards the horizon. Our century's boundary-pushing art attracts the question of "Why would anyone create this?" -- and the paintings of many Dutch realists were met with similar criticism. Why would such talented people want to paint such common, low-life things? 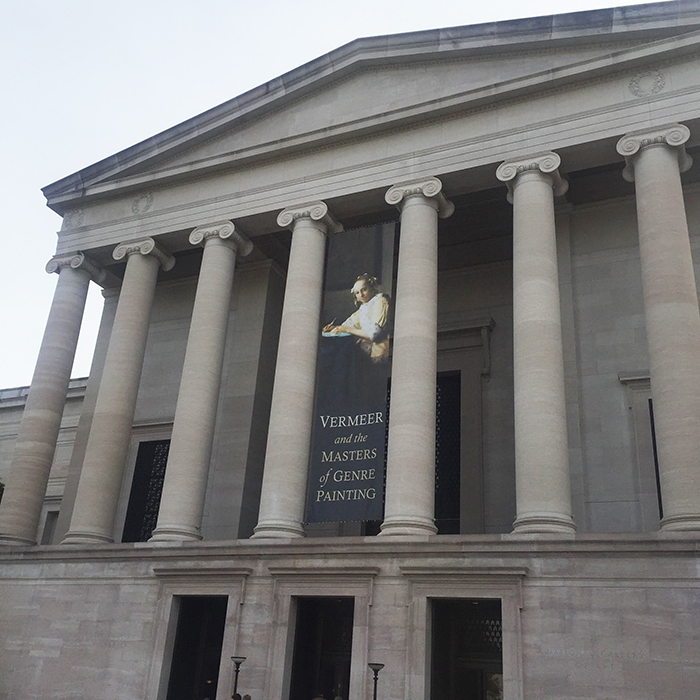 Vermeer and The Masters of Genre Painting at The National Gallery gives us a chance to imagine a 17th century artist visiting an art show and seeing a painting of a woman writing a letter. The painting absolutely galvanizes the artist - after leaving the show, the artist goes back to the studio, and in a fury, composes and begins developing a painting of an even better, more realistic letter-writing scene. These non-momentous paintings of everyday life, as mundane as sending an email to your coworker, are called Genre Paintings. 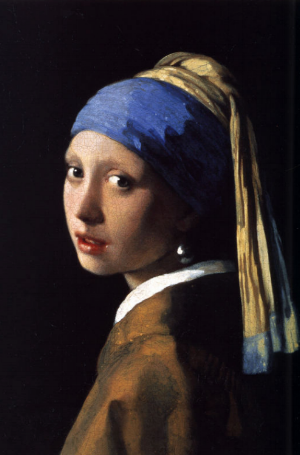 Though not at the D.C show right now, Vermeer's Girl with a Pearl Earring is among his best-known works, and carries hints on Vermeer's interest in painting non-grandiose subject matter. She's could be anybody, yet you get the feeling that she is somebody. This enterprise of Genre Painting makes sense in a pre-photography, pre-copyright world, where the drive to create realism invited painters to absolutely master their toolsets. There were no laws against taking a pre-existing painting and making your own, better version of it. This wasn't even looked down upon at all or stigmatized as 'copycat' work. It was just what painters did. What we see in this show is the art of the remake and the results of close-quarters competition. Each painter is like a bird of paradise - they are all birds, yet they all have special tricks to convince us of their reality. Imagine people 400 years in the future visiting a gallery that shows the original animated film of Ghost in the Shell and the remake of Ghost in the Shell, and our contemporary attempts at remakes will seem just as quaintly pioneering and far away as these paintings. They're so similar, yet so different! There is also always an obvious winner. Remakes emerge from a weird place of love and ambition: We love what the artist has done, yet we have a feeling we could do better. Or, we just love it so much and the art resonates with us so deeply, that, like kids at Disneyland, we must have more of it - we want to do it again! This was Jan Steen's vision of the Bathsheba tale: "Bathsheba Receiving David's Letter" (b. 1626 - d. 1679) Bathsheba is an old character from an old book, but there are so many ways to reimagine her in new settings. The Genre Painters captured their time, again and again - and while at first their motives may seem distant and repetitive, we only have to think about how much we try to capture our lives on Instagram or Twitter. The magic of a Vermeer is that his small paintings can be expanded into a 30-foot banner, yet it's still impossible to find flaws or even visible brushstrokes in his work. The show does a great service in bringing Genre Paintings into their own element, a kind of welter-weight class: not the most massive, but so acute! If these paintings were left in other galleries next to more grandiose paintings of landscapes, museumgoers would probably just cruise right along. This show also reveals to us why Vermeer is regarded as the best amongst his peers, despite the fact that his subject matter didn't involve kings and queens. Vermeer paintings are at maximum a foot high, and usually they are much smaller - six inches or less, tiny windows into an interior world. Looking at a Vermeer can feel like looking through a telescope that sees through time - no matter how close we get to the canvas, the figures stay locked in their eternal past, yet utterly alive.